At this point in the blog I’m 30+ reviews behind what we’re currently watching. This isn’t usually a problem. Most of the movies we watch are memorable in some way, so I don’t have trouble recalling what I liked or disliked about them by the time I get around to writing a review. But every once in awhile I come across a movie like Lockout, something so generic that I can hardly remember who was in it, let alone plot details, setting, dialogue… This is really just a forgettable film no matter how you slice it. Before I pop onto the movie’s Wikipedia page to refresh my memory, let’s see what I can remember on my own: Guy Pearce is a bad guy turned good guy, I think? He’s definitely sent to a space prison to save the president’s daughter, played by Maggie Grace. She cuts her hair to disguise herself as a prisoner at one point… Aaaand I’m out. I assume they make it to safety, only because Grace is blonde and pretty and no one would want to see her die. I don’t think she and Pierce hook up at the end, which would be a plus (if it’s true). OK, a quick read of Lockout‘s synopsis doesn’t really help me remember most of this movie. There’s the plot I do remember: the president’s daughter gets taken hostage in a space prison while investigating claims that the stasis the prisoners are kept in causes them to go crazy, and Guy Pearce is sent to rescue her. The rest of the story seems overly complicated and confusing. Pearce’s character was accused of a crime, but the man who can clear his name is also in the prison. The prisoners are also being used in illegal experiments. The space prison accidentally crashes into the International Space Station. There’s a lot going on here, and I feel like half of it was unnecessary. Lockout is just really, really forgettable. I remember being bored watching it, and I’m getting bored writing this. This one is definitely a skip. I bought this generic action film because I heard it was ok and it didn’t get released in Australia until about three months after it was released on DVD in America. So I snapped it up and thought I’d be enjoying some awesome futuristic action flick before many of my fellow Australians had the opportunity to enjoy it. I was wrong. It is a stretch to call this film B grade. The film’s only redeeming feature is the performance of Guy Pearce, who is doing his best John McLane impression as the snarky disinterested hero. Pearce plays Marion Snow, a ruffian who is wrongly convicted of conspiracy to commit espionage against the United States. While on his way to a new state of the art prison in space, the inmates of that prison riot and take control of it. They take the prison guards hostage, among these guards also happens to the President’s daughter Emilie Warnock (Maggie Grace). The US government, knowing full well that Snow is not actually responsible for the crimes they convicted him of, offer him his freedom if he can get into the prison and get Emilie out. He arrives to find a headstrong young woman who won’t leave the prison without the rest of her fellow hostages, making Snow’s job all the more difficult. This feels like a direct to DVD movie. The fact it got a theatrical release at all really surprises me. The production values are not great, and outside of Pearce, Grace, and Peter Stormare, the cast is very much full of unknowns. The film feels very generic and does not add anything to the action or sci-fi genre that we haven’t seen a hundred times before. As I said before, the film’s shining light is Guy Pearce. He does his best with a somewhat boring character. He is clearly channelling Bruce Willis from the Die Hard franchise. The only problem with that is that he isn’t John McLane. Nobody is. He tries hard and has some funny one liners, but not much else. Maggie Grace also does what she can as the damsel in distress. I like Maggie Grace from her days on Lost and as Liam Neeson’s daughter in the Taken films, but she is not great here. Her character is a cookie cutter action movie girl, and just like the rest of the film, there is nothing new here that we haven’t seen before. 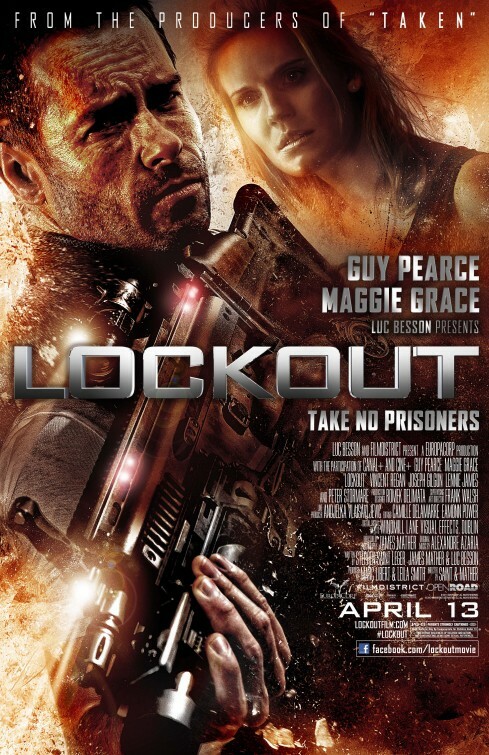 Lockout is a B or even C grade film masquerading as an A grade action film. Outside of Guy Pearce, the film is instantly forgettable.